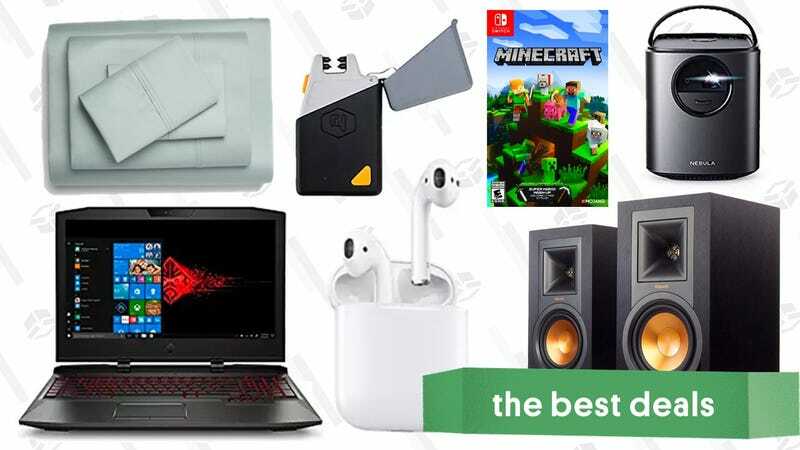 Today’s best deals kick off with a rare discount on Apple’s AirPods, a portable projector, an HP Omen gaming laptop sale, and more. If you don’t mind buying a refurb, you can get a seriously good deal on an HP Omen gaming laptop from today’s Amazon Gold Box. Prices start at just $700 for a 15" computer with a Core i7 processor and a GTX 1050, and range up to $1700 for a fully specced out 17" with 32GB of RAM and a GTX 1080, but there are a lot of options in between to fit your needs. Just note that like all Gold Box deals, these prices are only available today, or until sold out. Minecraft has been available on the Nintendo Switch eShop for awhile, but if you prefer physical copies, or just want to save a few bucks, you can get it from Walmart today for just $20. The Switch version can play online cross-platform, and includes a bunch of Super Mario-themed skins and goodies as well.